SpaceX founder Elon Musk is quick to note the Dragon spacecraft has flown in orbit before. An earlier Dragon capsule circled Earth twice and returned to Earth in December 2010, becoming the first privately-owned craft to reach orbit and land. But that mission used battery power, and it did not approach the International Space Station. Both the 2010 flight and the upcoming mission are aimed at fulfilling NASA demonstration objectives for subsequent flights to deliver cargo to the complex. The spacecraft on SpaceX's next flight will test new systems minutes after launch, beginning with deployment of two solar array wings vital to generating electricity for the mission. 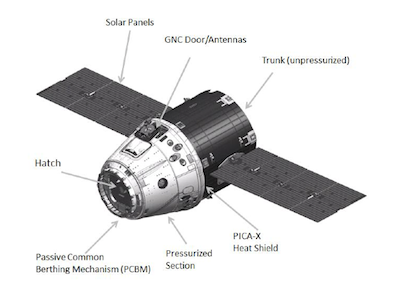 Check out a fact sheet on the Dragon spacecraft, and view a timeline of the capsule's first day in space. The Dragon which flew on SpaceX's first NASA-sponsored demonstration mission 2010 looks a lot like the craft launching Saturday. But the new Dragon is much more sophisticated, incorporating solar energy, advanced navigation sensors, and a communications link with the International Space Station. "The space station is zooming around the Earth every 90 minutes, and it's going at 17,000 mph," Musk said. "You've got to launch up there and you've got to rendezvous and track the space station to within inches, really. This is something that's going 12 times faster than a bullet from an assault rifle. So it's hard, but I think we've got a pretty good chance." A new flight computer will also debut on the mission. "This time, it is much more complicated," said Alan Lindenmoyer, manager of NASA's commercial crew and cargo program. "This Dragon is going to be the first spacecraft that SpaceX has developed with a heat rejection and power generation system. That means it's the first time you will see the spacecraft deploy its solar arrays in order to generate power." Aerodynamic shields covering the solar arrays will be jettisoned moments after the Dragon spacecraft deploys from the upper stage of the Falcon 9 rocket at T+plus 9 minutes, 49 seconds. The solar array extension sequence will begin at T+plus 11 minutes, 53 seconds. Once fully unfurled a few minutes later, the panels will stretch 54 feet tip-to-tip. "It's a greatly enhanced Dragon," said Gwynne Shotwell, SpaceX president. "It has a power generation system, meaning solar arrays. We did not have those on the first mission." "The other difference is less physical, but the software is dramatically more complex this mission," Shotwell said. "And we're also dual redundant on every system." A test of the Dragon's absolute GPS navigation system begins less than an hour into the mission. Dragon will open its instrument bay door at T+plus 2 hours, 26 minutes, exposing the craft's grapple fixture, LIDAR laser rendezvous sensor, and thermal imaging camera. "This Dragon will be the first time you'll see a flight of the rendezvous proximity systems, the LIDARs and the imagers that are requirement to give the proper range and range rate information that is required as the vehicle gets closer to the station," Lindenmoyer said. All of those systems will be required for Dragon's rendezvous and berthing with the space station, which is scheduled for three days after launch. A close flyby of the complex is planned two days into the mission to test the systems thoroughly. "[This Dragon] has a charging system, cooling pumps, a thermal radiator, cabin circulation fans, and all this equipment that's necessary for meeting the requirements for mating with the International Space Station," Lindenmoyer said. Another important change on this flight is the addition of a berthing port at the forward end of the spacecraft. 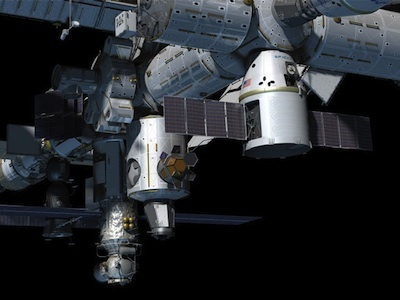 It will be the attach point with the space station's Harmony module. "This is the first time that SpaceX is flying a common berthing mechanism," Lindenmoyer said. "This is the mechanism used on all vehicles that are berthed to the space station. That is assembled onto this Dragon, as well as a hatch that SpaceX developed so we can enter the vehicle." NASA requires extra measures for vehicles flying to the space station. Computers and software must be able to detect and respond to failures to ensure the spacecraft does not threaten the space station and its crew. "It's also the first time we'll see the operation of the new flight computers on the vehicle," Lindenmoyer said. "These are specially redundant computers in order to meet the requirements for the space station. Those will be demonstrated on this mission." The solar arrays are mounted on Dragon's trunk section, an unpressurized module designed to haul secondary payloads and exposed cargo to the International Space Station. There are no supplies in the trunk on this mission. The 12-foot-diameter trunk section will be jettisoned before the spacecraft plunges back into the atmosphere for re-entry. The trunk will burn up while the Dragon capsule makes a parachuted landing in the Pacific Ocean. 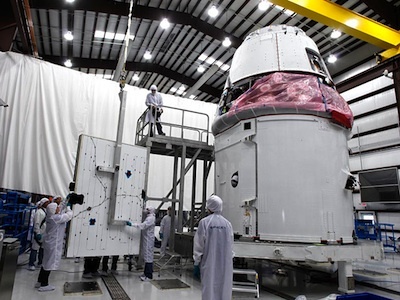 "This will also be the first time we will see the trunk separated from the Dragon spacecraft. On the previous mission, Dragon was separated right at the trunk plane. This time, the trunk and the Dragon will be separated from the second stage, fly all the way to station, and then it will be separated before the re-entry," Lindenmoyer said. It will take a little over three days - about 75 hours - for the Dragon to fly from the launch pad to a position just underneath the space station, close enough for the outpost's crew to grapple it with a robotic arm. "There's no space station on the ground, so our work has been done by simulation and by approximating the circumstances it will find in orbit and approaching the space station," Musk said. "The first flight was tough," Lindenmoyer said. "This is even more complex."